Traditional design cream soft cotton kurta pajama costume for baby boys. 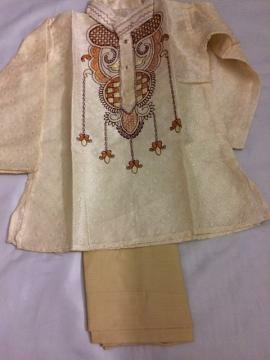 The self design kurta / shirt has ethnic pattern embroidery that is very typical of Bengal. Pajama / pant is included. Ideal for durga puja, diwali or any other festival. Good for kids aged 1 to 2 year old. This item in Kurta Pajama for Kids category was first added to our catalog on 09-02-2016. Buy Baby Boy Traditional Cream Kurta Pajama Dress, sold & shipped by desiVastra.com where you can shop online for Traditional Dress for Baby Boy & Girl, Indian ethnic Wear for Kids. This Kurta Pajama collection has been tagged as Children Readymade Kurta Pajama, Boys Apparel, Kids Wear Clothing, Indian Outfit Online.